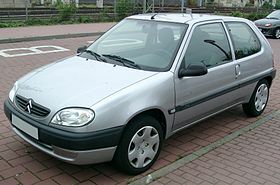 The Citroën Saxo was a city car produced by the French manufacturer Citroën from 1996 to 2004. It was also sold in Japan as the Citroën Chanson. It shared many engine and body parts with the Peugeot 106 (which itself was a development of the Citroën AX), the major difference being interiors and body panels. Production ended in 2004, when it was replaced with the Citroën C2. All engines were from the PSA TU engine series that powered the Peugeot 205 from 1988 and the Citroën AX, and had their roots before that with the OHC PSA X engine various other PSA cars used, such as the Citroën Visa, Peugeot 104 and early Peugeot 205. The range included five petrol engines and one diesel engine, all naturally aspirated. Although the quoted power outputs are low in comparison to modern small hatchbacks, or even to other hatchbacks of the time, the kerb weight was generally very low, with even the range-topping VTS having a kerb weight of just 935 kg (2,061 lb), with other smaller engine models (except the diesel) being around 100 kg lighter than this. This meant a high power to weight ratio resulting in decent acceleration and made the car suitable for city driving. Aside from the VTS which had 16 valves, all engines were the older SOHC units which meant relatively low city MPG figures. Even the popular 1.1i engine would struggle to achieve more than 35 to 40mpg in town when driven carefully. The real world consumption between the smaller engines and the nippy 1.4i westcoast/furio variant was hardly noticeable, however the insurance premiums were. The early 1.0i was quite under powered, with the 1.1i being considered much better, since it was nearly 200cc larger and had roughly 30% more torque. The Westcoast, later replaced by the Furio which featured a 1.4I 8V 55 kW (75PS/75BHP) engine with a top speed of 175 km/h (109 mph), and a 0-62.5 mph (0–100 km/h) time of 11.2 seconds. The VTR MK1 (1997–1999) featured a 1.6I 8V 66 kW (90PS/89BHP) engine with a top speed of 187 km/h (116 mph) and a 0-62.5 mph (0–100 km/h) time of 10.0 seconds. The VTR MK2 (1999–2003) featured a 1.6I 8V 72 kW (98PS/97BHP) engine with a top speed of 193 km/h (120 mph) and a 0-62.5 mph (0–100 km/h) time of 9.4 seconds. The VTS 16V featured a 1.6I 88 kW (120PS/118BHP) engine with a top speed of 205 km/h (127 mph), and a 0 to 60 mph time of 7.8 seconds. The VTS MK1 (1997–1999) and MK2 (1999–2003) shared the same performance. These models included 247 mm (9.7 in) vented front brake discs, with the VTR and VTS also having rear brake discs (solid 247 mm (9.7 in) discs). Also, a different style of control arms and struts was used for the suspension. The VTS had a 22 mm (0.9 in) master brake cylinder, and the VTR and Westcoast/Furio had a 19 mm (0.7 in). The VTS had a 19 mm (0.7 in) front anti roll bar and 22 mm (0.9 in) rear anti roll bar, while the VTR and Westcoast/Furio had a 19 mm (0.7 in) front and 21 mm (0.8 in) or sometimes 19 mm (0.7 in) rear antiroll bar. In addition, all the sports models featured a unique bodykit to the other models, commonly known as the "VT" bodykit. In 1997 the Saxo's three speed automatic gearbox was combined with the 1.6i 8V 66 kW (90PS/89BHP) engine which was available on the Saxo SX and VSX. Then, in the end of 1997, the 1.6i automatic was replaced with a 1.4i 55 kW (75PS/74BHP) engine. The 1.6i was more powerful with a top speed of 176 km/h (109MPH) compared with the 1.4's top speed of 103 mph (166 km/h). The equipment list was generally sparse, with budget models having drivers airbag, seat belt pre tensioners, cassette player, heated rear screen and tinted windows, and early Mark Ones with keypad immobilisers and a clock in place of a tachometer and three stud wheels, much like the AX. Further up the list sunroofs, PAS, Electric windows, ultrasonic alarm, passenger airbag, CD player, tachometer, front fog lights, bodykits, colour coded mirror caps and alloy wheels were added, to name a few. Although MK2 Saxos were generally better equipped than their older counterparts, the interiors were still dated in comparison to other small hatchbacks of the time, such as the Vauxhall Corsa, with many of the center console controls originating from the older Citroën AX model. The 1.6L VTR and VTS Saxos were the best equipped, with both gaining rear disc brakes as opposed to drum brakes, and ABS as standard for the VTS and an optional extra on all other 1.6L models. Few special models were released throughout the Saxo's life, most notably the "Open Scandal", a Saxo with a full length sliding canvas roof. Other special editions added certain extras to the lower end model, such as sunroofs or PAS. Notable models are the Westcoast up to 1999 and the Furio to 2003, as they incorporated the standard Saxo bodykit found on the VTR and VTS with a more insurance friendly 1.4L engine. Air conditioning was never an option on right hand drive Saxos because the blower motor was mounted in the bulk head on the driver's side. As a result, there was insufficient space available to accommodate the evaporator, except by first ducting the air flow to the passenger's side and then at the expense of the glove box. Although an after market kit was available that did exactly this, the resultant pressure loss made the system noisy and ineffective. The blower motor could also not be easily relocated, since the windscreen wiper motor was mounted in the passenger's side space. As with many other small cars of the time, the standard stereo system included 5.25" drivers mounted low in the front doors and 4" drivers mounted in the rear quarter panels (5 door models had 5.25" drivers all round). It was a popular modification to improve on the systems overall frequency range by mounting separate tweeters in the A-panel trims, similar to many models from Volkswagen of the time. The very thin door cards and metalwork did however leave the system very 'thin' sounding. This problem could be avoided however through the use of sound deadening insulation in the door cards. In-car entertainment modification was among the most popular upgrade for Saxo owners as this was one of the areas of the car that was lacking the most. PAS became standard on all but the very basic models. More subtle changes were alterations to the rear lights (the indicator sections are more "white") and the engine control unit moved from a single plug to three plugs. The old three stud wheel layout was also dropped. There was also a minor facelift, during the first phase of the car's production, in line with the then current releases by Citroën, moving towards a rounder look. To the eye, there are stark differences between the Mark I and Mark II Saxo, but little changed inside the vehicle. The dashboard and glovebox arrangement remained the same with the possible addition of a passenger-side airbag in some high range models. By 2003, some buyers were more attracted to the spacious, and practical five door C3. However, the 1.6 VTR and VTS models remained popular. The Saxo finally finished production in September 2003, when the three door C2 was launched. Its twin, the Peugeot 106, also ceased production at this time. By the end of the Saxo's production life, its design was seven years old. In September 2000, it was a EuroNCAP sufferer of poor results, along with its twin, the 106. The Saxo has a drag coefficient of 0.340. In addition its frontal area is 1.83 m2. Giving it a CdA ft² just 6.68. ^ a b "Citroën Saxo 1.1i X technical specifications - Carfolio.com car specifications pages". Carfolio.com. Retrieved 2011-08-07. This page was last edited on 16 April 2019, at 14:32 (UTC).